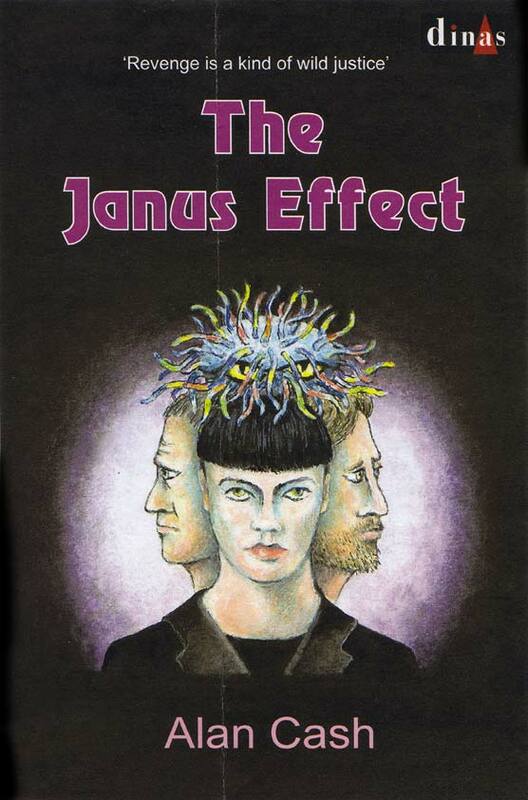 This is the cover of my novel " The Janus Effect". It was created by Solihull Artist Valerie Just, a retired Fine Arts Teacher, who is a member of The Solihull Artists Group and has had her work exhibited at the RBSA in Birmingham. I gave her the idea of what I wanted and she then did a line drawing in pencil on our kichen table. It was amazing seeing it take place in front of me just like that - takes real talent! Then she did a water colour version and then finally rendered it in acrylic. I submitted it to the publisher and they liked it straightaway. The two heads of the man represent the head of the god Janus who stands at the gate of the old year and the new, looking backwards and forwards in time- as it's a time travel novel - hence The Janus Effect. The woman's head represents his bodyguard, the mysterious Lady in Black. The curious tentacled thing above them is an Asgathi - it was too difficult to do lots of little ones- in the novel they are minute water-borne entities that band together in times of stress to create one big gestalt organism, with thousands of little eyes looking out at 360 degrees.